18.39"-22.64" x 24.76" x 14.75"
Cons: This is the second monitor to have the audio stop working ! Acer should be ashamed for making a product like this and Newegg should should sell garbage like this ! This is horrible stay clear of this monitor! Cons: A dead pixel or what ever I don't know what it is . Other Thoughts: My first purchase from acer and probably the last one I mean come on after waiting for 11 days I got shocked when I saw the dead pixel in the right side of the monitor. Don't they have employees to check before they put it in the box ? . + Top-handle to facilitate carrying this near 30lbs beast. + Lots of options available in the OSD menu; e.g. remove blue light, various constrast settings, view mode presets, overclocking, etc. Cons: - Integrated speakers are extremely tinny-sounding and of poor sound quality IMO. - Awkward brown spot at the bottom of the screen - almost in the bottom-middle. It comes and goes; I can get it to disappear if I raise the nits to 300+, but stays on anything below ~300. At times, it will literally flicker on-off, especially when SDR is 'ON'. It also will become very dark when I move my mouse through it at times - as if it's trying to apply dynamic contrast but doesn't correct itself afterwards like the areas around it. Other Thoughts: I'm coming from an ASUS VG Series VG278HE 27-Inch 1080p 144Hz monitor to this and I can say what a major, MAJOR difference/improvement! I tried an Asus IPS 60Hz panel back in 2013 but the ghosting was intolerable for FPS gaming. Beautiful picture quality, but poor refresh/response time. I settled with the VG278HE which was a TN panel with a personally acceptable pixel pitch of 0.311mm. The light-bleed was bad, but tolerable. I skipped over 2k-res monitors and waited for what would appear to be the right time to get a 4k IPS that was capable of at least 120Hz native. It's nice now because get to enjoy the latest tech; HDR, G-Sync, HDMI 2.0 and DP 1.4 as well. At this time, I'm currently rocking a GTX 970 and can not get higher than 98Hz refresh rate no matter what and I can't enjoy HDR; 98Hz is still smooth viewing. This will change soon enough when I upgrade my card. I read online that depending on your Nvidia card, you'll want to install the DisplayPort firmware updater from Nvidia to support DP 1.4 from the card. Unboxing the monitor was painless. The top box inside housed some booklets, cable assortments, the monitor side panel flares (for lack of a better term), a VESA bracket and finally the AC power brick. Remove said box and the monitor is positioned upright underneath already connected to its base. Lift out via its top handle and give it a home. Hook up the cables and done. The monitor is very stable in its upright position connected to its original base. Moving the monitor is easy and yet adequately stiff in whatever position it is left in. Can lower and raise the monitor, tilt up and down, and pivot left or right. So far, no complaints here regarding this. There are 4 buttons and a joystick behind the monitor on the right-hand side for interacting with monitor settings; pressing any of the non-power buttons will display the quick menu which will show the current active monitor settings and allows for quick-switching the monitor profile modes, the brightness level and the input type. Pushing the joystick in directly will display the advanced menu settings. I explored the available menu options and set the monitor to my liking. There is even the option to save your changes to 3 profile-looking modes. Overall, it did take me some time playing around with the buttons and such to get a feel for how to work the settings efficiently. I guess from here, we'll see how this monitor stands up to the tests of time and if needed, how good Acer support is regarding fixing issues. Acer does include a decent size warranty card that states that dedicated, 'premium' support service is included with this monitor - witch a dedicated phone number to call and a web link to chat with a 'Predator line service professional' if needed. At the bottom of the card is what appears to be a couple serial-like looking set of alpha-numeric lines of text - making me think that these might be important if reaching out to Acer support so may want to safeguard said card. Pros: The picture quality on this monitor is incredible. 4K at 27" looks very crisp and detailed and the contrast is very good beating out any other LCD I've owned. Colors are also vibrant and the out of the box calibration looked good. 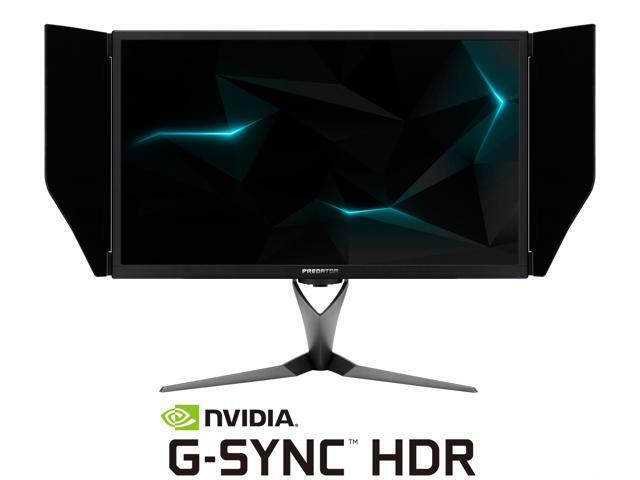 G-Sync works as it should giving the smoothest possible experience at any frame rates and the max refresh rate of 144Hz makes the gaming experience even better provided you have the hardware to reach frame rates that high. HDR on this display blew me away when I first used it with vibrant colors and a very high peak brightness. Makes me wish more games on PC supported HDR. You might be wondering why I've given this monitor such a low score after speaking so highly of it. More will be explained in the "Cons" section. Cons: After about a week of use I noticed a stuck pixel in the lower left part of the screen that was stuck on red. Even with the high pixel density of this screen it was still very noticeable even if I moved further back from the monitor. I tried for a few nights running programs to fix the stuck pixel but nothing worked. I was on the fence about sending it back until I noticed a dead pixel around the same area of the stuck pixel. After seeing this I set up an RMA with NewEgg for a replacement. This monitor costed way too much for me to put up with pixel defects like this and I don't think anyone should should who buys this monitor. If I get a replacement that I am satisfied with I will update this review and the score but until that happens it will remain at one egg. Other Thoughts: It's worth mentioning that 4K takes a lot of GPU horsepower to run games at with ultra settings. My 1080 was passable with the games I tried bringing in levels of performance that was just playable. I then bought a used 1080Ti for cheap and sold my 1080 and the 1080Ti does much better of course but to get frame rates closer to 120 or 144 you'll need much more GPU power. Cons: -the haloing effect due to the FALD technology, which is very minor. I literally only noticed it when I was playing with the settings on f.lux and turned the brightness all the way down. I do not notice this when gaming (I primarily play destiny 2) or everyday use. Other Thoughts: - everyone mentions the fan, it is not audible to me, either gaming with hdr or otherwise (you can hear it if you go directly behind the monitor and put your ear up close). - I saw this German reviewer on youtube (it is a popular video for this monitor) really criticizing this monitor, but I'm convinced that he got a bad panel because mine does not have any of his problems. Pros: I picked this monitor up with a 200$ off sale. Worth the cost. I was coming from a 27" 1440p 60hz non-gsync IPS panel that I've had for the past 8 years and this was a whale of an upgrade. My use cases are gaming / graphic design / development. I much prefer the aesthetic of this monitor over the "gaming" atheistic of the ASUS PG27UQ. Arrived with no dead pixels/issues. Pros: 4k 144hz 422 hdr10 is everything i can ask for, due to video card limitations i play in 1440p windowed most the time. One of the best screens available for HDR console gaming. Cons: DP 1.4 instead of 1.4a, unfortunate timing since that would support 444, and the 2080 ti is 1.4a. Other Thoughts: For 10+ years I chose wide color gamut on 60hz over high refresh TN panels (better colors, video card limitations), this is the first panel that combines color accuracy, wide gamut, 120/144hz, and hdr on a single panel, while only giving up a little on colors to NEC and Ezios monitors. Been waiting for this combo for a long time. Seen a decent amount of negative reviews and buyers know what they are paying, no reason to whine about the price after the fact. As for the fan, i dont notice it since my comp is louder. This is cutting edge tech, most who has seen it in person are satisfied with the picture quality to say the least.